Artist Scott Gundersen sure can draw a beautiful portrait, but the Chicago-based artist has taken his oversized drawings to the next level by repurposing discarded wine corks to color his pieces. Gundersen collects and stores the corks in his studio, standing thousands of them on their ends to make up the range of flesh tones of his subjects. Stacked around his studio, the corks are separated according to tone and color. Gundersen has a place for each cork, first scrutinizing the drawing to determine the placement of the tonal range. Using the cork, he “paints” the image, gradating from light corks to darks to create the dimensions of his subject’s face, neck and hair. 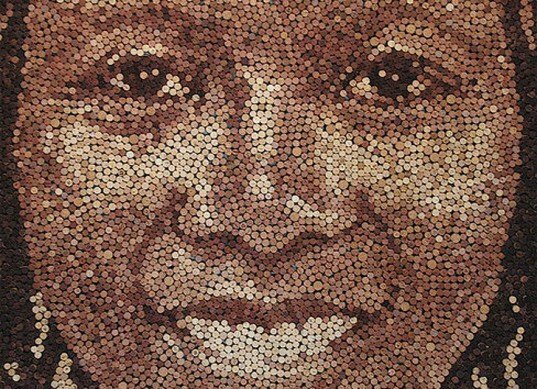 The corks are packed tightly together, and affixed to the portrait backing. The giant 96 x 66 inch portrait of “Grace” took Gundersen 50 hours to actually build up. 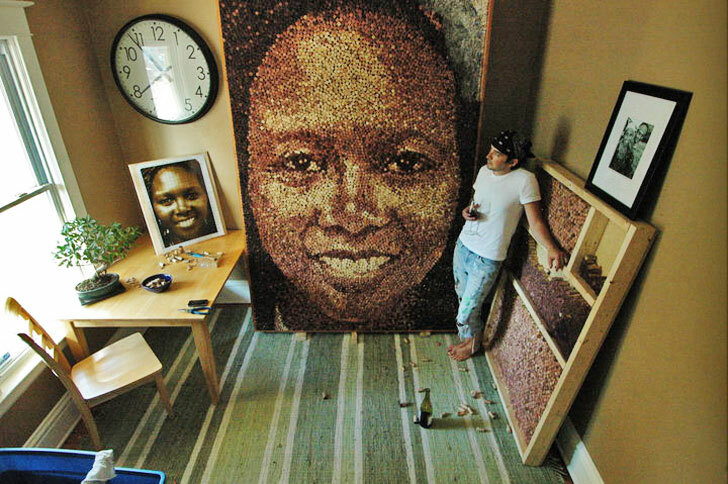 “Grace” used an incredible 9,217 corks to it! Gundersen’s cork portraits have been featured in Ripley’s Believe it or Not and on many news programs. He uses the cork as a way to draw attention to the importance of recycling and sustainability through art. Muito original, muito bem conseguido. Maneira inteligente de Arte. Parabens pela originalidade. Stacked around his studio, the corks are separated according to tone and color. Gundersen has a place for each cork, first scrutinizing the drawing to determine the placement of the tonal range. Using the cork, he “paints” the image, gradating from light corks to darks to create the dimensions of his subject’s face, neck and hair.